Doing online surveys to download your desired software, game, e-book is the most irritating work i have ever seen. It happens with people most of the time when they are looking for some very useful software and after finding it when they tries to download, surveys shows up. It doesn't allow us to download the file until we complete one of the survey. At present no one will spend time in completing them. Earlier surveys were only used to collect feedback from the users about the product they are viewing or downloading but now a days they can be seen everywhere without any purpose. In today's time the main purpose of most of the surveys is only earning money. It has now become a popular way to earn money. People applies surveys on their files so that no one will have access to them until they will complete the survey. After completing the survey they gets money and the user have access to their desired files. But sometime even after completing the survey you end up with the wrong file. But don't worry i have found some ways to save your time, in this article i will show you some ways to bypass surveys online for free. Quiet interesting ? Yes it is. It's one of the simplest way to bypass online surveys from different websites. You just need to enter the web address and that's it. Surveys will be removed in just seconds!. Remember you must check some option after entering the web address. You can check in the image below only those options must be checked. It will help the tool to encode URL, encode page, allow cookies, remove scripts and remove objects. Following below is a list of most bypassed sites through this tool. If you face any survey from below listed websites then don't take tension, it will surely remove. Another tool to bypass online survey. It's a freely available software to bypass survey. App can be used on any platfrom and it's easy to use. 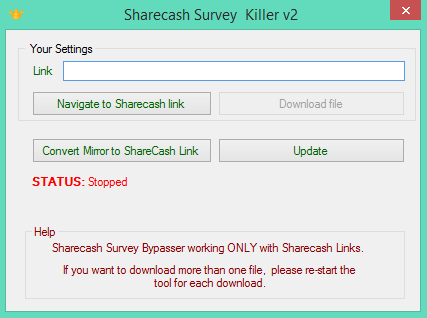 The only drawback of the tool is that it only removed surveys from Sharecash. It doesn't help in bypassing other websites surveys. Do you know of any apps that can bypass surveys for android phones? I've been searching for what seems like forever trying to find one. No Johnnie there is not any app available to bypass surveys on Android phone. If you want to bypass surveys then use the above method only. There can be some apps on Android which claims that they can bypass surveys, remember! stay away from them because they can contain malwares or viruses. Know about the app completely then download and install it on your phone. Can u share the link to Sharecash Downloader without password or upload it ASAP... ??!! Thanks for posting such a great tutorial. I wanted to download many files but the surveys were the hurdles. Now I will download all the files I want. Do you know any app or site that can bypass survey from dollarupload?